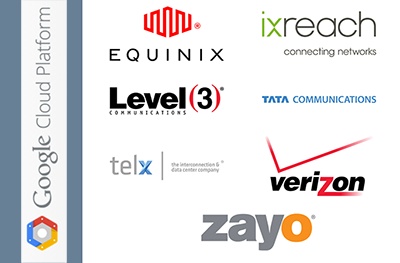 Equinix, IX Reach, Level 3, TATA Communications, Telx, Verizon, and Zayo are the initial service providers supporting the newly launched Google Cloud Interconnect service. Google Cloud Interconnect provides dedicated connections into edge locations of Google's global network via the service provider partners. Google also offers direct peering at 70 points of presence across 30 countries. Interconnect egress is priced at up to a 50% discount compared to regular Internet egress, with no additional port fees. Ingress is free. In addition, Google announced boosted TCP throughput and connections per second limits for its Andromeda network virtualization stack. Andromeda enables Cloud Platform networking services such as firewalls, routing and forwarding rules using Google's internal APIs and infrastructure. Andromeda's TCP throughput for a single stream has now been boosted from 2 Gbps to over 3 Gbps. For 200 streams, Andromeda now delivers 5 Gbps of TCP throughput. Equinix is launching direct access to Google Cloud Platform in 15 markets worldwide via its Equinix Cloud Exchange. Specifically, Equinix will offer up to a 10Gb connection to Google cloud services with full bursting capabilities, enabling applications running in a private cloud to “burst” into the public cloud for computing capacity when demand surges. Equinix said its connections will be enterprise-grade, with guaranteed bandwidth to Google’s network edge. 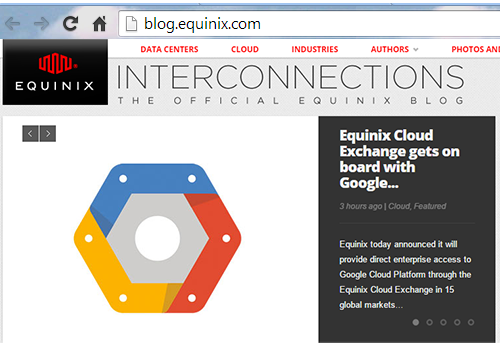 Access to Google Cloud Platform will be available through the Equinix Cloud Exchange in 15 markets spanning the Americas, Europe and Asia Pacific, including Amsterdam, Atlanta, Chicago, Dallas, Frankfurt, Hong Kong, London, Los Angeles, New York, Paris, Seattle, Silicon Valley, Singapore, Tokyo and Washington, D.C.
“Offering flexible, low-latency connections to the cloud is the primary goal of the Equinix Cloud Exchange, and adding Google to our impressive portfolio of cloud providers will be well received by our customers. By offering direct access to cloud services such as Google’s Cloud Platform, enterprises will now have multiple high-performance connectivity options to enable their hybrid cloud strategies,” stated Ihab Tarazi, chief technology officer, Equinix. 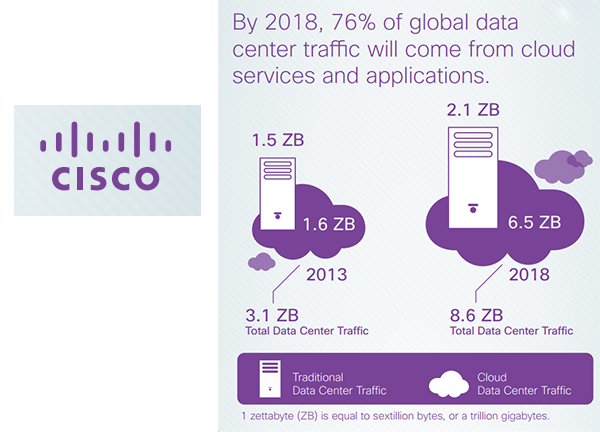 By 2018, global data center traffic will reach 8.6 zettabytes per year with 76% of all data center traffic originating in the cloud, according to the newly published Cisco Global Cloud Index (GCI). 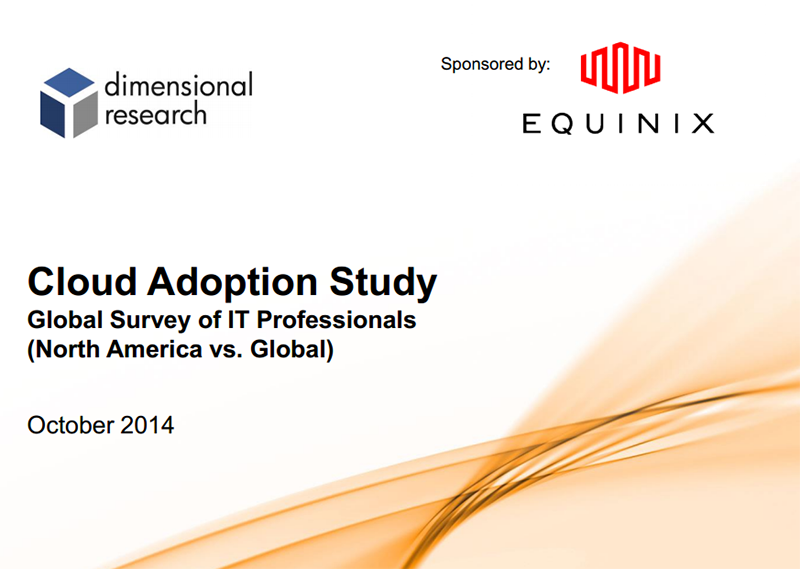 Globally, cloud data center traffic will grow 3.9-fold by 2018, at a CAGR of 32% from 2013 to 2018. The Cisco report assesses regional and country-level cloud-readiness by comparing average network speeds and latencies (fixed and mobile). "When people discuss cloud, they often focus on public cloud services or public cloud storage services. However, a very significant majority of today's cloud workloads are actually processed in private cloud environments. Even with public cloud workloads having significant growth, by 2018, almost 70% of cloud workloads will still be private cloud-related, requiring the ability of workloads to bridge across a hybrid private/public cloud environment," said Kelly Ahuja, Cisco, Senior Vice President, Service Provider Business, Products, and Solutions. By 2018, 53% of all residential Internet users globally will use personal cloud storage, and the average consumer cloud storage traffic per user will be 811 megabytes per month by 2018, compared to 186 megabytes per month in 2013. By 2018, 69% (113.5 million) of the cloud workloads will be in private cloud data centers, down from 78% (44.2 million) in 2013, and 31% (52 million) of the cloud workloads will be in public cloud data centers, up from 22% (12.7 million) in 2013. By 2018, traffic between data centers and end users will reach 1.5 ZB annually (17% of total data center tra ffic). 0.7 ZB (8%) will come from traffic between data centers, such as replication and interdatabase links. But the vast majority of data center traffic, 6.4 ZB (75%), will still be coming from within the data center, such as storage, production, development, and authentication traffic. The countries with the leading fixed network performance in 2014 are (in alphabetical order) Hong Kong, Japan, Korea, Luxembourg, the Netherlands, Romania, Singapore, Sweden, Switzerland and Taiwan. The countries with the leading mobile network performance in 2014 are (in alphabetical order) Australia, Belgium, China, Denmark, Korea, Luxembourg, New Zealand, Oman, Qatar and Uruguay. 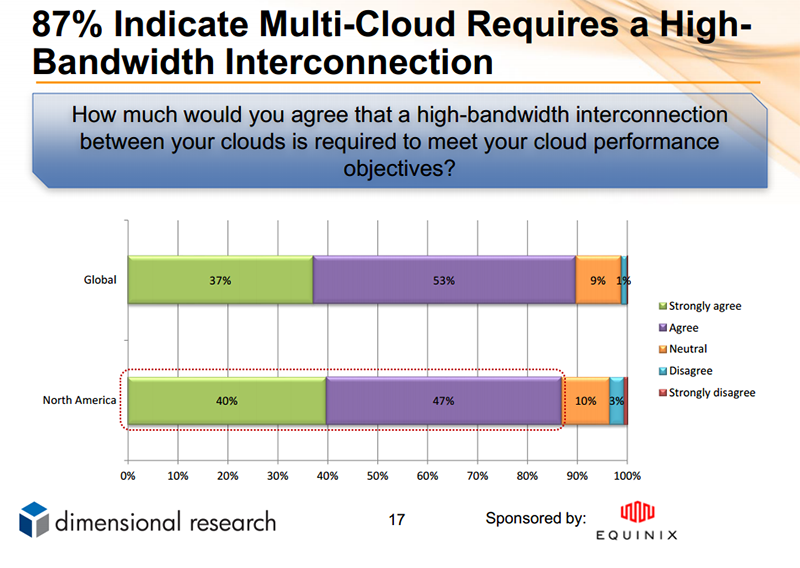 The vast majority of IT decision makers plan to implement multi-cloud architectures in the coming year, according to a survey conducted by Dimensional Research and sponsored by +Equinix. The survey looked at key drivers for implementing a multi-cloud enterprise strategy, including reasons to consider an interconnected colocation data center. Survey respondents indicate they plan to deploy multiple, geographically dispersed clouds in 2015, and 74 percent are budgeting for a multi-cloud migration strategy. Over the next 12 months, a significant number of business applications such as storage/backup, disaster recovery and business intelligence, among others, will be deployed to the cloud, and many of those workloads with third-party colocation providers. “What surprised us about this survey is how quickly multi-cloud strategies are becoming the norm worldwide. Businesses have discovered that collocation provides a meaningful ROI for WAN optimization and it is clear that multi cloud deployment will improve the ROI even more,” stated Ihab Tarazi, chief technology officer, Equinix. 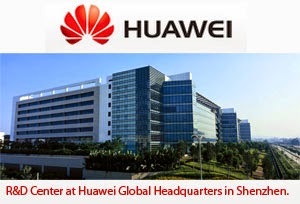 China Telecom Fujian (Fujian Telecom) and China Telecom Beijing Research Institute have tested Huawei's Transport SDN controller for implementing an intelligent private line Bandwidth on Demand (BoD) app for VIP customers. Zha Jun, President of Huawei Fixed Network Product Line, said, "Huawei cooperated with China Telecom to deploy the innovative BoD private line app based on the transport SDN. The deployment is a key milestone that effectively pushes progress of the transport SDN industry. Huawei will continue to cooperate with China Telecom in developing cutting-edge 400G, 1T, 2T, and SDN technologies, and building a flexible, synergetic, intelligent, and open next-generation transport network." 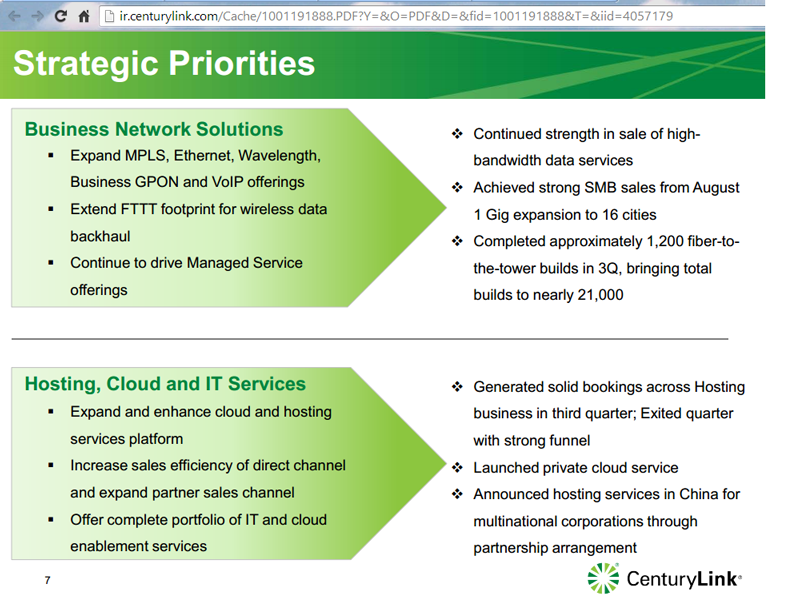 CenturyLink reported operating revenues for third quarter 2014 of $4.514 billion compared to $4.515 billion in third quarter 2013. Core revenues were $4.08 billion, a 0.6% year-over-year decline, compared with a 1.0 % year-over-year decline in third quarter 2013. Revenue from high-bandwidth data services grew approximately 17% year-over-year across business and wholesale customers. GAAP net income for third quarter 2014 was $188 million compared to a net loss of $1.05 billion for third quarter 2013, and diluted earnings per share for third quarter 2014 was $0.33 compared to a net loss per share of $1.76 for third quarter 2013. "CenturyLink's third quarter results reflect our continued success in meeting the demand from business customers for high-bandwidth data services, colocation, managed hosting, cloud and IT services," said Glen F. Post III, chief executive officer and president. "In our Business segment, high-bandwidth data services revenue, including MPLS, Ethernet and Wavelength, grew nearly 12% year-over-year and we achieved year-over-year revenue growth in this segment for the fifth consecutive quarter. We expect the expansion of our symmetrical 1 gigabit service to 16 cities that we announced in August to create additional opportunities to drive strategic revenue growth from businesses and consumers in the months ahead." Revenue growth driven by increased high-speed Internet and CenturyLink Prism TV customers. Strategic revenues were $712 million in the quarter, a 6.4% increase over third quarter 2013. Generated $1.49 billion in total revenues, a decrease of 0.8% from third quarter 2013, reflecting the continued decline in legacy services offsetting the growth in strategic services. Added approximately 14,000 CenturyLink Prism TV customers during third quarter 2014, increasing penetration of the more than 2.2 million addressable homes to approximately 10.3%. Revenue growth driven by continued demand for high-bandwidth data services and solid sales momentum. Strategic revenues were $677 million in the quarter, a 6.1% increase over third quarter 2013, driven by strength in high-bandwidth offerings such as MPLS, Ethernet and Wavelength services. Generated $1.57 billion in total revenues, an increase of 1.6% from third quarter 2013, as growth in high-bandwidth offerings and data integration revenues offset lower legacy services revenues. Data integration revenues were $22 million higher in third quarter 2014 compared to third quarter 2013. Continued strong sales momentum in third quarter with solid sales funnel entering fourth quarter and continued success in sales of Managed Office and Managed Enterprise solutions. The Wholesale segment ended the quarter with approximately 21,000 fiber-connected towers, an increase of 17% from third quarter 2013. Strategic revenues were $560 million in the quarter, down slightly from third quarter 2013, as increases in wireless carrier bandwidth demand and Ethernet sales were offset by declines in low-speed data revenues. Generated $843 million in total revenues, a decrease of 4.0% from third quarter 2013, reflecting the continued decline in low-speed data revenues and in legacy revenues, primarily driven by lower long distance and switched access minutes of use, along with access rate reductions from implementation of the CAF Order. Completed approximately 1,200 fiber builds in third quarter 2014 and remain on track to complete approximately 2,500 for full-year 2014. The Hosting segment grew managed hosting (including cloud) and colocation revenues as cross-selling initiatives and product enhancements continue to strengthen sales opportunities. Operating revenues were $361 million in the quarter, a 5.6% increase from third quarter 2013. Managed hosting revenues were $147 million, representing a 14% increase from third quarter 2013, and colocation revenues were $163 million, a 4.5% increase over the same period a year ago. Launched new private cloud service available on the same industry-recognized platform as CenturyLink's public cloud service, enabling new hybrid IT capabilities. Qualcomm reported revenue of $6.69 billion for the fourth quarter of its fiscal 2014, up 3 percent year-over-year (y-o-y) and down 2 percent sequentially. Operating income was $1.99 billion, up 25 percent y-o-y and down 4 percent sequentially. Net income came in at $1.89 billion, up 26 percent y-o-y and down 15 percent sequentially. d. "We are forecasting continued growth of global 3G/4G device shipments in calendar year 2015, particularly in emerging regions. Our fiscal 2015 outlook reflects continued LTE leadership in our semiconductor business and is tempered by the issues we are facing inChina related to our licensing business. Through this time, we remain focused on building our technology leadership in smartphones, while pursuing opportunities to extend our solutions into adjacent areas," stated said Steve Mollenkopf, CEO of Qualcomm. In its quarterly report, Qualcomm said calendar year 2014 and 2015 global 3G/4G device shipments are expected to be approximately 1.3 billion and 1.5 billion, respectively. However, its estimate of calendar year 2014 3G/4G device shipments that it currently expects to be reported by its licensees is approximately 1.04 billion to 1.13 billion. 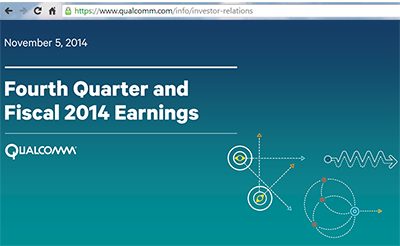 The shortfall reflects units that Qualcomm believes may not be reported by customers, are in dispute or are currently unlicensed. MRV Communications reported Q3 2014 revenue of $43.2 million, up 12% from $38.4 million a year earlier. Total net loss was $1.0 million or $0.14 per diluted share. “During the third quarter of 2014, we grew total revenue 12% due to the continued strong performance of our Network Integration business, which was partially offset by a modest slowdown in our Network Equipment business,” said David Stehlin, MRV’s chief executive officer. “The soft telecommunications capital spending environment in the Americas and EMEA impacted our revenues during the quarter while, at the same time, we continue to transition from older, legacy products to a new, market-leading, packet and optical product portfolio. These new products have distinct market and technical advantages, already recognized by the market. 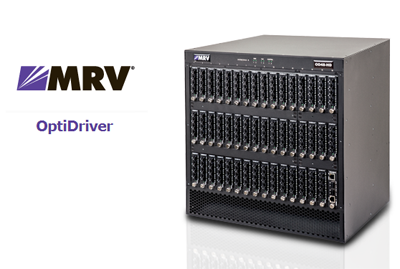 “OptiDriver, our new optical transport platform, continues to perform well. In the third quarter, we increased our total customer count to more than 30 by adding 15 customers, 9 of whom are new users of MRV optical transport solutions. Notably, we won our first multi-million dollar contract from a large regional North American communications service provider in the quarter." Network Equipment revenue was $22.0 million, down 4%, primarily reflecting the current capital spending environment in the telecommunications market. Network Integration revenue was $21.2 million, up 36% primarily due to growth in project related product sales. Palo Alto Networks announced discovery of a new "WireLurker" malware attacking Apple OS X and iOS platforms. In a technical alert bulletin, the company said WireLurker marks a new era in malware across Apple's desktop and mobile platforms. The first malware family to automate generation of malicious iOS applications through binary file replacement. Palo Alto Networks has released signatures to detect all WireLurker Command & Control communication traffic. "WireLurker is unlike anything we've ever seen in terms of Apple iOS and OS X malware. The techniques in use suggest that bad actors are getting more sophisticated when it comes to exploiting some of the world's best-known desktop and mobile platforms. 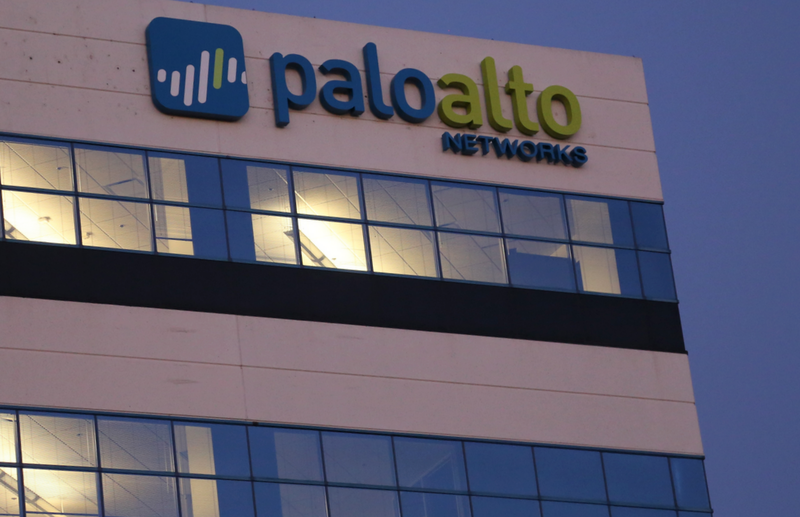 As such we have provided full protection to Palo Alto Networks customers and published a detailed report so others can assess the risk and take appropriate measures to protect themselves," stated Ryan Olson, Intelligence Director, Unit 42, Palo Alto Networks. 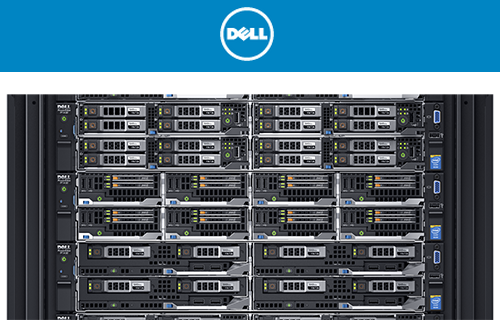 Dell Storage SC4020 Entry-Level All-Flash configuration, an all-flash storage array for $25,000. It ships with six 480GB enterprise-class read-intensive SSDs, providing over 2.8TB raw flash capacity. The system can be expanded to 24 SSD drives in the 2U chassis. Dell XC Series of Web-scale Converged Appliances for integrated compute and enterprise storage -- a single chassis for compute/storage and powered by Nutanix software for scale-out applications. With the Nutanix Distributed File System (NDFS) running on each appliance, HDDs and SSDs can be aggregated across all nodes, with automatic compression and deduplication to increase effective storage capacity. “Project Latte”, a new streaming TV service developed by Bell Media, announced distribution deals with TELUS, Bell Canada, and Bell Aliant. The new video streaming service will now be carried by TELUS Optik TV, Bell Fibe TV, Bell Aliant FibreOP TV, and Bell Satellite TV subscribers at launch.